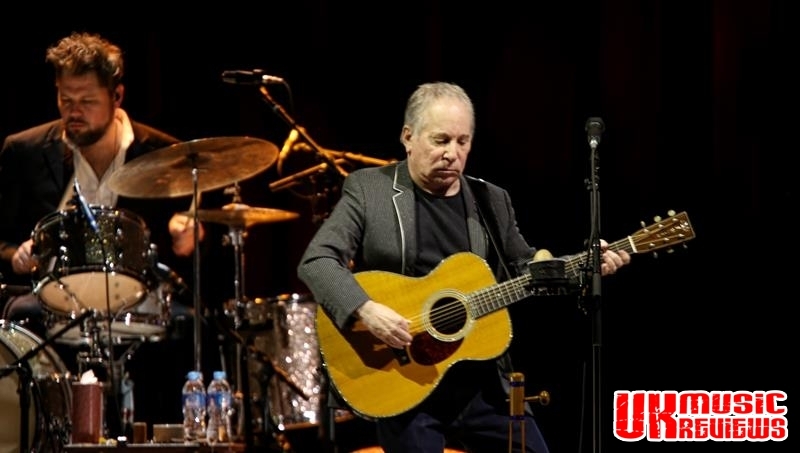 Paul Simon arrived at The Motorpoint Arena Nottingham last night on the back of a critically acclaimed number one album, Stranger To Stranger, his fifth in a career spanning six decades, and at 75 years young he has lost neither his artistry as a songwriter, nor his zest for performing live. Treating this packed Arena to some of his biggest hits, sprinkled with some of his newer songs, the two and a half hours that he was on stage just flew by. Surrounded by a sublime nine piece band, it soon became apparent that this show was to be a joyful celebration of a unique songbook. With the band taking the lead in opener Gumboots, Simon came onto the stage to deliver The Boy In The Bubble from his hugely successful 1986 album Graceland. 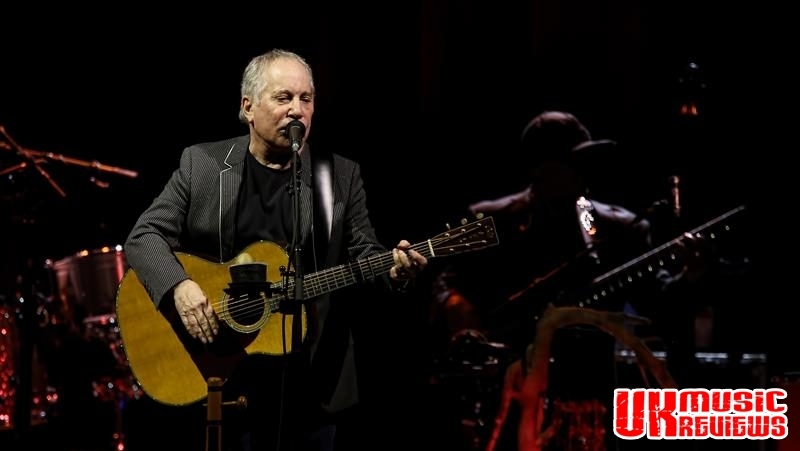 There was an enthusiastic response from the audience when he belted out his well worn classics such as 50 Ways To Leave Your Lover, Dazzling Blue, and Spirit Voices. 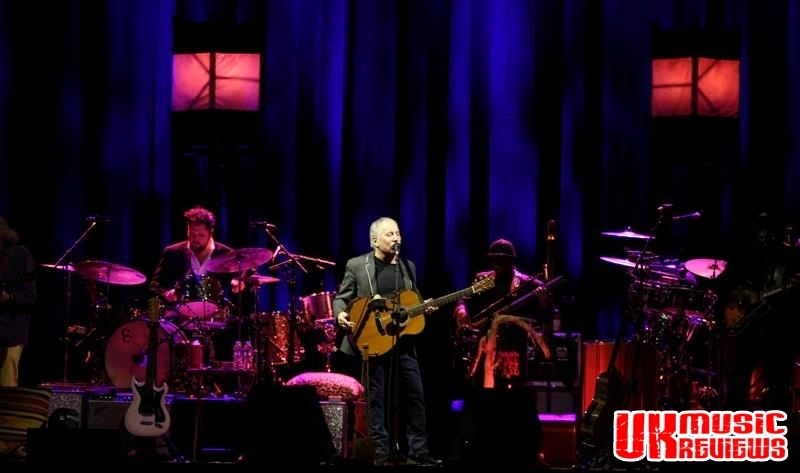 The delighted crowd were treated to numerous sections of an undoubted supreme catalogue with an old foray into Brazil with songs like The Obvious Child and The Cool Cool River, the latter being inspired by his trip down the Amazon. 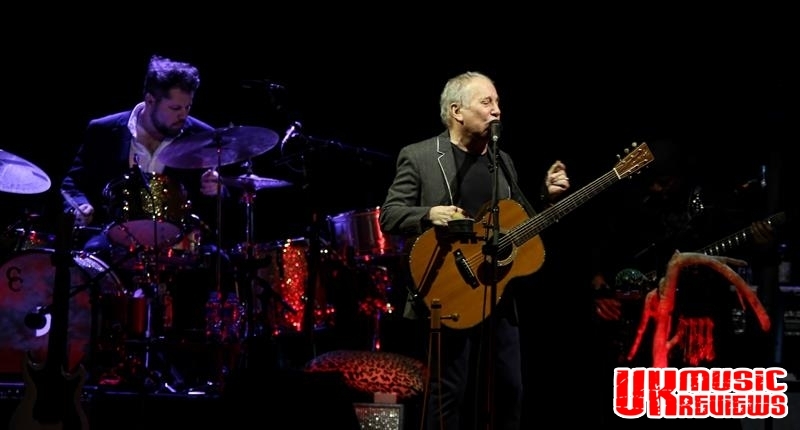 Whilst Simon’s singing voice may have lost a little of it tone with age, Paul Simon will always be a legend. 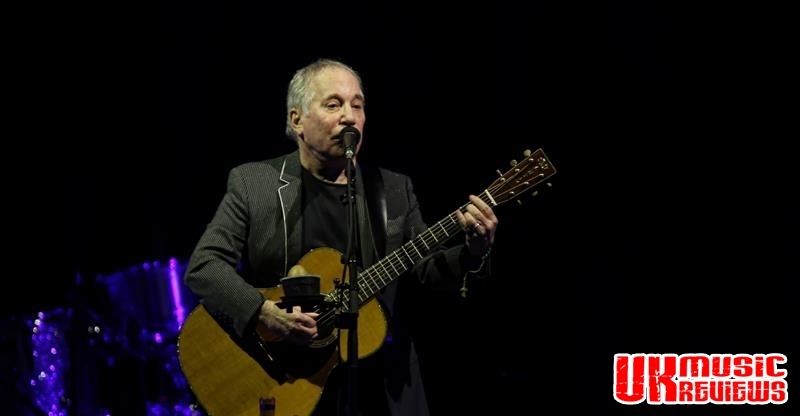 Reaching into the sack full of Simon & Garfunkel oldies there was the subliminal mid 60s track America, delivered with the lights dimmed and Simon standing at the front of the stage, singing the words with a searing sadness. Another early song of longing, Homeward Bound, written on Widnes Station, had the audience singing along to the chorus, whilst El Condor Pasa showed just how brilliant his band were as they swapped instruments and delivered a first class display. But the new tracks showed a return to form as Simon continues to experiment with musical styles whilst maintaining simply beautiful lyrics and outstanding tunes. His singing on Stranger To Stranger was utterly fantastic, sensitive and emotional, whilst he upped the tempo with The Werewolf and Wristband; a true story about him being locked out of his own concert. Finishing the main set in true party style with Diamonds On The Soles Of Her Shoes and You Can Call Me Al, there wasn’t a single seat occupied. Graceland and Still Crazy After All These Years were included in the first encore, whilst the overlooked gem of One Man’s Ceiling Is Another Man’s Floor gave way to a mass sing along of the Simon & Garfunkel hit, The Boxer. 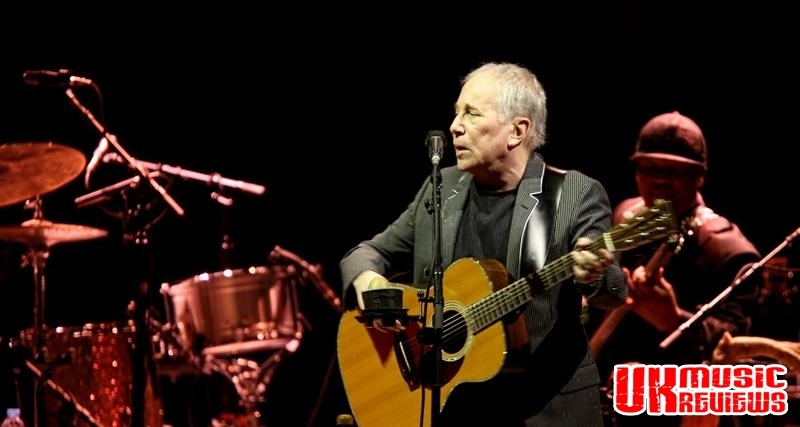 Coming back on for a spine tingling American Tune, the show brought back memories of a packed Hyde Park, when in 2004 Simon & Garfunkel silenced the crowd with an unforgettable Bridge Over Troubled Water. 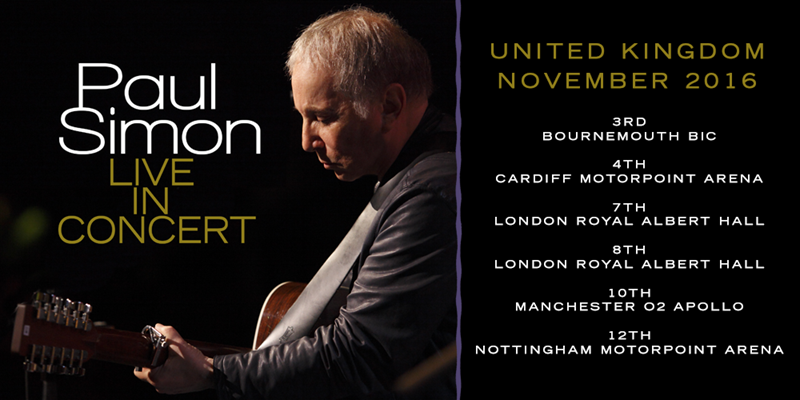 That wasn’t given an airing last night but Simon looks much happier without Garfunkel and what is extraordinary is that he can play a set this long and engaging and still miss out so many of his classics like The Sound Of Silence. He may just come back next year for that and if he does he will again be playing to a packed Arena. He was sheer class.